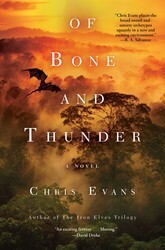 In honor of New York Comic-Con this weekend, we’ve got an excerpt from Of Bone and Thunder, the upcoming fantasy novel by acclaimed author Chris Evans. Apocalypse Now meets The Lord of the Rings (yeah, we went there, nerds) in this bold new tale set against the rigid, deadly backdrop of the Vietnam War. So, scroll down to take a look at his super-captivating prologue. And be sure to get your hands on a copy of the book when it comes out on October 14th! A black condor dipped her featherless head and flapped her wings, straining for height. Another vulture drifted in front of her, forcing the condor to climb higher in the crowded wheel of circling birds. The condor struggled, her body weak from having little to eat over the past month. The sun had yet to crest the hilly peaks to the east, but already, dozens of baldheaded condors had taken up stations high above the mist-shrouded valley below. The other vultures were hungry, too. The birds flew without calling to each other. Only the sound of their massive wings working laboriously in the humid air marked their passage. The sky began to take on a rosy hue. Shadows cast from the eastern peaks drew jagged black teeth across the mist, reaching all the way to touch the peaks running parallel along the western boundary of the valley. Though the birds couldn’t see it, they knew a thick, brown river surged through a fertile plain of lush green vegetation far below them. They could, however, smell the life that teemed in the jungle, but that wasn’t why they had assembled so early. It was faint and distant. A soft, rhythmic sound that carried like the coppery tang of fresh blood through the humid air. It was a sound foreign to this land, but one to which the circling birds had quickly adapted. The condor dipped her right wing, allowing herself to drift beyond the wheel and out over the eastern ridge as she angled toward the distant sound. While the eagles continued to circle, the rest of the flock followed her, forming a descending spiral that eased into a single column as they leveled off above the ridge. The condor began to rise as she caught the heated air roiling up from the sun-warmed side of the ridge, but she ignored her instinct and tacked away from the updraft, continuing to follow the ridgeline toward the end of the valley. It was louder now, echoing off the ridgelines in a growing crescendo. She caught movement out of her right eye and tilted her head. The eagles were finally descending, coming straight down toward the sound instead of hugging the ridgeline. She was still accelerating when she exited the hole and the entire valley stretched out before her like a vast, green sea. The wet, thick air with all its earthy smells filled her nostrils as if she’d dunked her head underwater. For a moment, the pangs in her stomach vanished. Below, the dragons were hundreds of yards away and angling toward the ground. Apocalypse Now meets The Lord of the Rings, as the acclaimed author of the Iron Elves trilogy channels the turbulence of the Vietnam war in a bold new standalone fantasy!